With age comes the “philosophic mind”, wrote Wordsworth in his famous ode, Intimations of Immortality. Unfortunately, and far from poetic, age also ushers in afflictions such as diabetes, cancer, dementia, Parkinson’s disease, cardiovascular disorders, and musculoskeletal diseases. Asia is quickly waking up to the fact that it’s entering a zone of grim reality where age and chronic conditions affect ever-growing masses of its populations. Asia has also come to accept that the wild Fourth Industrial Revolution that’s taking place in every industry seemingly everywhere on the continent must also be brought to bear on its healthcare industry. It’s become obvious that, like every other industry, Asia cannot resolve its healthcare challenges without the intervention of robots, artificial intelligence (AI), and automation. The new frontier of aging in Asia is rapidly creating a new healthcare frontier where medtech robotics is integral to everyday living. A frontier where to be without robots would be unthinkable—just like every other industry. And just like every other industrial transformation, the healthcare industry is fast-moving and expensive. But if necessity is the mother of invention, healthcare and caregiving for Asia’s aging populations could well catapult medtech robotics, especially Asian surgical robots, into a mega-industry capable of servicing not only the aging but everyone else as well. Surgical robots are but one part of a medtech robotics industry that is segmented by product type, others being, rehabilitation robots, non-invasive radio-surgical robots (think, X-ray or Cyberknife), pharmacy robots, and general hospital robots such as patient care attendants, delivery & logistics, or disinfecting robots. Within the global medtech industry, which overall is forecast to reach $595 billion in sales by 2024, today’s medtech robotics industry is small ($6 billion in 2017)—and new—with a global forecast to grow to $16 billion by 2025. Again, small. Surgical robotics is a medtech segment with current revenues that seem teeny compared to future need. Even general endoscopy devices generated more revenue: $17.8 billion worldwide in 2016. Intuitive Surgical, the global leader in surgical robotics, and in business for a decade, generated $3.1 billion in 2017. With an aging population the size of Asia’s, $16 billion is but a small fraction of the segment’s potential. 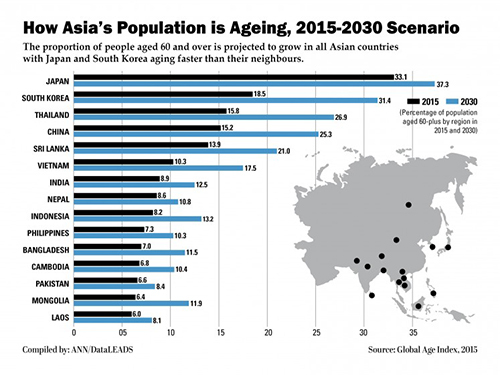 In short, aging Asia will be a huge market driver…as well as a mega job producer. So far, Asia’s response to the need for surgical robots has been piecemeal, at best. East Asia has spearheaded the efforts, with Korea and Japan leading-edge developers for the past several decades. Both have produced machines; Korea has the decided edge so far with Japan ready to introduce a contender in 2020. Overall, the surgical robotics industry is picking up speed, especially in China. 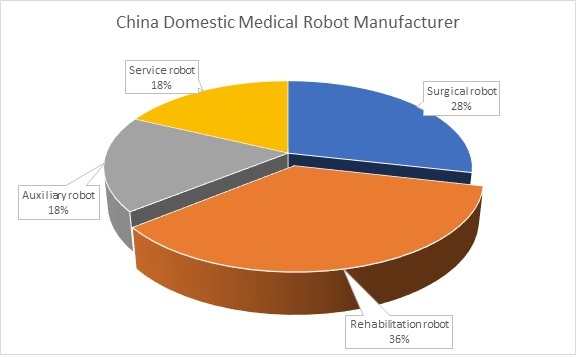 As of 2017, China is home to some 30 domestic manufacturers in the industry of medtech robots, with surgical robotics representing 28 percent of the total. Additionally, a key area of China’s recent Three-year Action Plan for Enhancing the Core Competence of Manufacturing Industry (2018 – 2020) is directed toward intelligent robotics and robotic medical devices. Intelligent medical robotics, taking advantage of China’s strong artificial intelligence (AI) ecosystem, is already a $1.95 billion (2017) industry, which is a year-on-year increase of 40.7 percent. Crossover AI to surgical robots is just a matter of time. China is going through some extraordinary lengths to attract talented companies and individuals to its high-tech ranks. Extraordinary, as in available nowhere else in Asia. For example, the Zhongkai Hi-tech Zone in Huizhou, has a budget of $15 million for “recruiting, training, incentivizing and providing support for talented individuals from around the world” to bring themselves, their companies, their tech and IP to Zhongkai for development. Amazingly, and truly a startup’s paradise, the Zhongkai deal includes venture capital funding, support for ongoing operations, support from other firms in related industries operated in the zone, plus living and housing allowances. So in addition to China scooping up multi-nationals in major M&A deals, it is also cruising along the value chain looking for young talent with bright ideas. Korea’s Curexo, Inc. developed Robodoc, which it claims as the world’s first fully automated robot for orthopedic surgery. Priced at $1 million per machine, Robodoc allows surgeons to perform knee or hip replacement using 3D computer imaging from CT scans. Worldwide, Robodoc has performed over 30,000 joint replacements. The Meere Co. (formerly Eterne), after seven years of development, is in the marketplace with the Revo-i. Used for general endoscopic surgery, including cholecystectomy and prostatectomy, the Revo-i uses four robotic arms to grasp a surgical site, cut and seal. The Revo-i allows a surgeon to insert a robot arm into the body of the patient after making a minimum incision, and surgeons can view three-dimensional images inside. Called EMARO, the robot-assisted surgery platform is being developed by startup Riverfield Surgical Robot Laboratory, which reportedly raised more than $10 million for development. With both the Korean Robodoc and Japan’s EMARO priced at half that of Intuitive’s da Vinci, Asian vendors are exhibiting price sensitivity that’s essential for widespread success nearly everywhere on the continent. Price is critically important in Asia. Unlike the modern healthcare systems of Korea and Japan and their smaller and more affluent populations, China’s masses sorely need access to less expensive surgery options. Of the continent’s 365 million people 65 years old and over, 240 million of them live in China (that’s 40 million more people than the entire population of Brazil). China’s Tianjin University has developed a minimally invasive surgical robot system called the Micro Hand S. From 2014 to 2015, the system went through human clinical trials, operating on patients in need of laparoscopic surgery. With no technical problems or complications encountered in the trials, the Micro Hand S has the potential to be a safe and effective system for surgeries in the future. The TiRobot system, co-developed by Beijing’s Jishuitan Hospital and Tinavi Medical Technologies, has been successfully utilized for spinal surgery. Tian Wei, a a spinal surgeon at Jishuitan Hospital Tian, said surgical robots have and revolutionized medicine by overcoming the physical limits of the surgeon’s sight and steadiness of hand. Treatment for most spinal patients, he said, was “conventional medicine or none at all, but with robots, difficult and risky surgeries have become safer”. Hu Jie, chairman of Jiangsu Klude Intelligence Tech, said: “I seriously doubt there will be a domestic medical robot that can compete with da Vinci in China within 10 years. “We have a favorable government policy. We are not short of investment [TiRobot got $58 million] and the market is huge. But it is way too optimistic to think China can lead in the field of medical robots. Such sentiment was the driving force behind the recent (2017) purchase of the TransEnterix (US-based) SurgiBot System to China’s Great Belief International Limited (GBIL) for $29 million. Following the FDA’s denial of the SurgiBot 510(k) in April 2016, GBIL stepped forward with its offer, while TransEnterix turned its attention to marketing its other surgical robot, the FDA-approved Senhance System. If GBIL can get SurgiBot through China’s own FDA gauntlet, the CFDA, then China has a surgical robot already to rock and roll. The market leader, Intuitive Surgical, by the end of 2017, had shipped 5,770 robotic surgery systems, with 65 percent of all global installations in the United States. China has over 29,000 hospitals as a homegrown marketplace for SurgiBot (U.S. 5,000 AMA registered hospitals). If SurgiBot sells well (meaning at a price well below that of the da Vinci) and becomes the de facto surgical robot standard in China, it has a distinct possibility of becoming the de facto standard in all of Asia. Moreover, there’s massive potential for AI to utilize the flood of patient surgical data to train robots and as well as to learn from diagnostics from surgeries. Asia might easily catapult from also-ran to global leadership very quickly.